Known for two decades of cutting-edge innovation, BIGHORN, America’s premier luxury lifestyle community, recently introduced the next phase of luxury living, The Penthouse Collection. Built on 20-plus years of excellence, this incredibly lofty vision has come to full realization. BIGHORN’s Penthouse Collection features four penthouse residences offering a completely unique residential experience. Ranging in size from 5,150sf to 6,790sf atop BIGHORN’s new 80,000sf Clubhouse, at 1,000 feet in elevation each Penthouse enjoys spectacular views of mountains, fairways, and city lights. Created by the genius of internationally renowned designer, Guy Dreier, are four different, distinctive and dynamic floorplans. As the name and the talent behind some of the most forward-thinking and iconic homes in the world, Dreier further applied his considerable design talents to completing two of these Penthouses with exquisite furnishings created and selected solely for them. These modern interiors of unparalleled elegance offer an environment for comfort, relaxation and ease of living. From each Penthouse threshold, one enters a world all one’s own – with privacy, security and access to immediate, exclusive services at the center of the Club. Dreier designed the Penthouses to have a ‘Wow!’ reaction from your first step out of the private elevator. Penthouse 303, is two-stories with a 21’ high ceiling and a dynamic stairway of striking Italian granite. 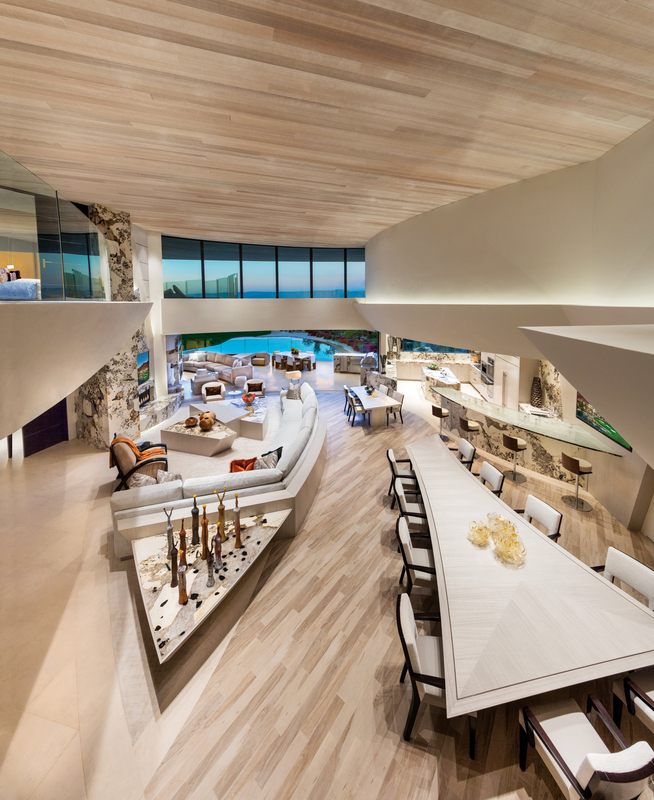 The stairway and a unique cantilevered bridge above it surround a beautiful entertainment lounge with a clear, cylinder of an elevator ready to take you to the upstairs master suite and mezzanine office. Beautiful Crema Pya limestone flooring, custom furnishings and floor-to-ceiling glass showcase the “only from here” views. The 6,790sf open floorplan offers a fully-appointed chef’s kitchen, two masters plus one guest suite, private patio deck with barbecue, dining and oversized spa. Penthouse 301, features over 6,000sf of interior space with an additional 1,922sf of entertainment patio. Wrapping around the outside of the Penthouse, the patio also includes an outdoor fireplace lounge, outdoor kitchen, and private oversized spa. Inside the gourmet kitchen features multiple Antarctica Cream granite islands, high-performance stainless steel appliances and a dining setting with a magnificent view of the valley and city lights. The master suite offers a fireplace sitting area, spacious closet and luxurious master bath with an awesome panorama of the Santa Rosa Mountains. In addition to spacious luxury, comfortable environments and beautiful views, the privileges of Penthouse ownership include private elevators, garage and storage rooms, and 24-hour access to the Penthouse Concierge where almost anything the homeowner could want is realized with just one call. Penthouse owners have private elevator access to the breathtaking Clubhouse that, much like the Penthouses, seamlessly blends indoor/outdoor living with sophisticated yet casual meeting spaces. The Clubhouse is home to The Pour House, The Hub, Golf Shop, The Jewel Box, fully appointed Men’s and Ladies’ locker rooms and countless other amenities. For more information about The Penthouse Collection at BIGHORN, visit bighorngolf.com/penthouse or call (800) 551-5578.